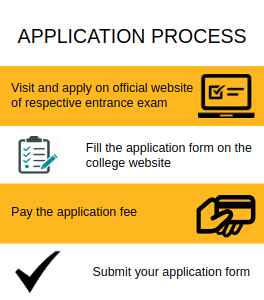 For registering in state or national level competitive examinations like- MHT-CET, MAH-MCA-CET, GATE, JEE Main, visit the official website of the respective conducting body. Downloads the application form available as per your course and send it duly filled with the required documents to the college. The candidate seeking admission to the architecture course have to go through aptitude tests specially designed to assess the candidate aptitude. The institution shall give weight age of 50% marks for aptitude tests in the matter of admissions. Original documents as per the list below along with 3 Attested Xerox copies of each document. Qualifying Bachelor's Degree Passing Certificate. Transfer Certificate / College Leaving Certificate. Domicile Certificate / Indian Nationality. Sponsorship Certificate (For Sponsored Candidates). Physically Handicapped Certificate (If physically handicapped). A candidate who doesn't have 10+2 scheme must have passed after 11 years schooling the higher secondary / pre-university or equivalent exam in the science group of any recognized university or board with English, Physics, Chemistry & mathematics as a compulsory subject. For Admission into the B.E Information Technology Branch, I have given C.E.T As Well As JEE.Eligibility Criteria is That The Student Should have Passed 10+2 and has cleared C.E.T.The Cutoff of IT Branch in Jawaharlal Nehru Engineering College is 90 out of 200. It is very easy to get admission for engineering at JNEC. 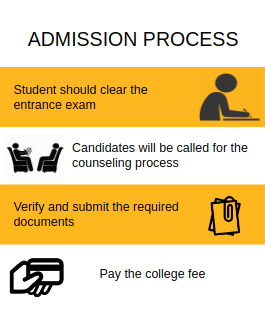 You have to pass CET exam with specific marks and apply online for admission. I gave the JEE as well as the CET exam Eligiblity is class 12th pass or post polytechnic. Typical cutoff ranges from 95-125 (open boys) for CET. For Maharashtra State Candidature Candidate and All India Candidature Candidate. II) 3 Passport Size Photos. III) Original documents as per list below along with 3 Xerox copies of each document. 1. JEE 2015 Score Card. 2. Domicile Certificate / Indian Nationality. 6. Migration Certificate (Students passing XII class from outside Aurangabad board region have to submit Migration certificate). Additional Documents required for Reserved Category Students. 10. Gap Certificate (If applicable). 11. Physically Handicapped Certificate (If physically handicapped). I) 3 Passport Size Photos. II) Original documents as per list below along with 3 Attested Xerox copies of each document. 2. Provisional Passing Certificate of Diploma. 5. H.S.C. Mark sheet (If applicable). 6. College Leaving Certificate (T.C.). 7. Nationality Certificate (If nationality is not mentioned in leaving certificate). 8. Migration Certificate (Other than Maharashtra State Candidate). 11. Physically Handicapped Certificate [If physically handicapped]. Additional Documents required for Reserved Category Students VALID UPTO 31st MARCH 2016.